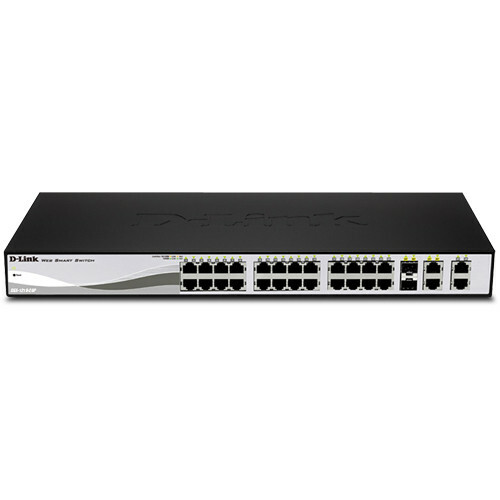 The DES-1210-28P Web Smart 24-Port Fast PoE Ethernet Switch from D-Link is a switch designed to give you sophisticated management and security functions for ensuring that your network is scalable and efficient. In a 1U rack mount size, the switch can be tucked away on a rack or it can sit on your desktop. In total, the switch features twenty-four Fast Ethernet ports, two Gigabit Ethernet BASE-T ports, and two combination Gigabit Ethernet BASE-T/SFP ports. To note, all of the Fast Ethernet ports support Power-over-Ethernet, so you can connect and power external devices, such as IP security cameras, routers, webcams, VoIP phones, and more. The first four of these ports can supply either 15.4W or 30W of power apiece while ports 5 through 24 can supply 15.4W apiece. As part of the switch's more advanced features, you can set up an Auto Voice VLAN on your network as well as an Auto Surveillance VLAN with video cameras. Because this switch supports these kinds of VLANS, you are spared the costs of dedicating expensive hardware or even facilities to do so. In addition to segmenting up your network into VLANs, you can also reserve bandwidth for more important functions and utilize the supported QoS for prioritizing traffic for important or latency-sensitive applications, such as video streaming or VoIP. Plus, to save energy, the ports can shut off PoE power at a predetermined time. The unit can also automatically turn on its built-in fan at a certain temperature, providing continuous, reliable, and eco-friendly operation. So as to ensure that your network runs smoothly, the switch supports the following Layer 2 features: IGMP Snooping, Port Mirroring, Spanning Tree, and Link Aggregation Control Protocol (LACP). It also supports IEEE 802.3x Flow Control for instituting fast direct connections to servers. For security, the switch supports 802.1X port-based authentication, Access Control Lists, and utilizes the D-Link Safeguard Engine for protecting the CPU against Broadcast, Multicast, and Unicast flooding. For integration and management, the switch features a web-based management interface that allows you to remotely control your network down to the port level. In addition, the switch features D-View 6.0, Command Line Interface, and features the SmartConsole Utility. With advanced security, management, and Power-over-Ethernet features, this Web Smart Switch is an invaluable resource and a stellar buy for your small or medium-sized business. Equipped with a complete lineup of L2 features, this switch includes IGMP Snooping, Port Mirroring, Spanning Tree and Link Aggregation Control Protocol (LACP). The IEEE 802.3x Flow Control function allows servers to directly connect to the switch for fast, reliable data transfer. At 2000Mbps Full Duplex, the Gigabit ports provide high-speed data pipes to servers with minimum data transfer loss. Network maintenance features include Loopback Detection and Cable Diagnostics. Loopback Detection is used to detect loops created by a specific port and automatically shut down the affected port. Cable Diagnostics are designed for network administrators to quickly examine the quality of the copper cables and determine the type of cable error. The innovative D-Link Safeguard Engine function protects the switch against traffic flooding caused by virus attacks. The DES-1210-28 switch supports 802.1X port-based authentication, allowing the network to be authenticated through external RADIUS servers. The Access Control List (ACL) feature enhances network security and helps to protect the internal IT network by allowing an administrator to restrict the access of a network through a variety of means including MAC address, IP, UDP/TCP, and even VLAN ID. The switch supports ARP Spoofing Prevention, which prevents the network from being cut off or eavesdropped by hackers using faked ARPs. For added security, DHCP Server Screening screens rogue DHCP server packets from user ports to prevent unauthorized IP assignment. The SmartConsole Utility easily allows customers to discover multiple D-Link Web Smart Switches within the same L2 network segment. With this utility, users do not need to change the IP address of their PC and it provides an easy initial setting of the Smart Switches. Switches with the same L2 network segment that are connected to the user's local PC are displayed on screen for instant access. This allows extensive switch configuration settings and basic configuration of discovered devices such as password changes and firmware upgrades. D-View 6.0 is a Network Management System that allows for the central management of critical network characteristics such as availability, reliability, resilience, and security in a consistent way. D-View 6.0 provides a useful set of tools for network administrators who want to effectively manage device configurations, fault tolerance, performance, and security. Command Line Interface (CLI) management through Telnet makes the adjustment of basic settings such as password changes or firmware and configuration file uploads possible. The Web Smart switch DES-1210-28 is designed to provide small-to-medium sized business users complete control over the network. With Ethernet and Gigabit copper ports capable of connecting to existing Cat.5 twisted-pair cables, this switch eliminates the need for a complex reconfiguration process. The DES-1210-28 allows for a flexible connection to a backbone or servers. All ports support auto-negotiation of MDI/MDI-X crossover, or configurable auto MDI, and therefore do away with crossover cables or uplink ports. Box Dimensions (LxWxH) 20.5 x 14.3 x 3.7"
DES-1210-28P Web Smart 24-Port Fast PoE Ethernet Switch is rated 5.0 out of 5 by 1. This switch can be used with Cisco switches, and routers.